My reviews are much less plentiful this month for two reasons: 1) I didn’t get much reading done for the first week of June because I was at BEA 2) I’m trying to get a jumpstart on the massive amount of reading I have to do for Dystopian August (since I’m planning on nearly two reviews per day) so some of the reviews will not be posting for a couple of months. You’ll see those books on my Book Challenge page and Goodreads read list, but nowhere else for a while. I’m running behind on my book challenge. *cries* I need to catch up. Eek! 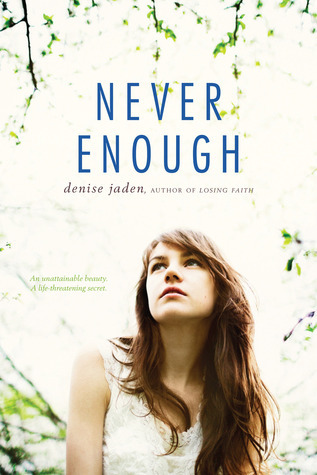 This month, as seen above, I’m giving away a copy of Never Enough by Denise Jaden. I had a bunch of favorites this month, and I wish I could afford to give away a copy of all of them. My first choices for giveaways are always ones I received for review, since I want to give back to the publishing house and the author. Since all of my giveaways this month are adult, I wanted to give away some YA fiction. Never Enough impressed me so incredibly much. I rarely give out 5s on the first read of a book, but after I wrote my review and tried to choose a rating, I realized that I couldn’t think of any reason to rate it down. Check out my review to learn more! This giveaway is international, so long as The Book Depository or some other similarly-priced, reputable online book store ships to you! Just fill out the Rafflecopter! Damn, 12 adult books. THAT IS AMAZING.